With requirements for pet travel to the UK likely to change with Brexit, the government is ordering a lot more pet passports. THE DEPARTMENT OF Agriculture has launched a tender worth €80,000 for the provision of 75,000 pet passports. Anyone wishing to travel from one EU country to another with a dog, cat or ferret must have a pet passport, and this also applies to travel between Ireland and the UK. The government doesn’t know exactly how many passports will be required each year, but said that 25,000 have been issued annually in the past. This new contract comes on the back of advice issued to pet owners earlier this month on what they’ll need if they’re travelling with them to and from the UK after Brexit. 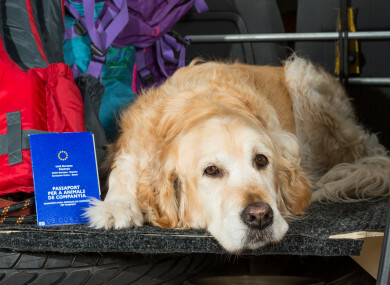 The requirement for the EU pet passport applies to cats, dogs and ferrets with the legislation meaning that if you’re travelling between EU countries with any of these animals, you need a passport for it. The 28-page document contains information on its latest rabies vaccinations, when it was microchipped and any other vaccinations it has. In awarding its contract, the Department of Agriculture said that it must receive the passports in boxes of 200, and delivered in consignments of 5,000. With Brexit looming, the pet passport that Irish pet owners possess should be sufficient in the event of a Brexit deal making its way through parliament in the short term. Whatever form Brexit takes, pet owners looking to travel are advised to contact a veterinarian as soon as possible before setting off to make sure all necessary arrangements are in place. In the event of a no-deal, however, a pet passport issued in the UK won’t be sufficient to return to Ireland with your pet. If travelling to Great Britain in a no-deal scenario, pet owners must ensure their dog/cat/ferret is microchipped, vaccinated against rabies, have an EU pet passport (so they can get back), have a rabies titration test. Furthermore, bringing anyone bringing a pet dog, cat or ferret into Ireland from Britain n will have to give the Department of Agriculture, Food and the Marine advance notice by email before arrival. Email “Government to award €80k contract for 75,000 pet passports ”. Feedback on “Government to award €80k contract for 75,000 pet passports ”.